It is very important in Netrunner to be able to pay for the cards you want to play. You pay using credits and you can get one credit by spending a click. This is far too slow, so you will want to put economy cards in your deck to give you credits faster than this. There are several different cards that give you credits, and they all work slightly differently. 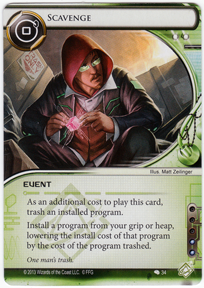 Posted in Blog Posts and tagged Android:Netrunner, lcg on December 23, 2014 by Tim. After a few plays, I am looking at tweaking my runner deck. This is pretty much just getting rid of cards I find I don’t play much, either because the time never seems right or because they don’t really fit into the overall strategy. First off, I will get rid of Scavenge as I can tell it is more of a combo card and not used on its own. Escher – This could be good to create a path to an agenda but it is too conditional. Just having the full set of breakers and enough economy should do me. Crypsis – Might be good as a general breaker but it is very expensive. It can hit a trap, but so can Tinkering at a pinch. Also the cost of a click is bad when facing lots of bioroid ice. You need your clicks to get past them for free. Inti – Cheap to install, but expensive to use, and the barriers are the strongest ice so the cost to break one can be extortionate. Maybe I need to consider another fracter option? Personal touch – This is good on breakers like Inti, but is not essential to my strategy. I will keep it if I have enough slots. Akamatsu Mem Chip – I do need mem units but is there another option? +2 Battering Ram – a less costly barrier-breaker. +1 Levy AR Lab Access – as a late game reset. +1 Omnidrive – to replace the mem chip. +1 Toolbox – also replaces a mem chip. +1 Freelance Coding Contract – to clear out duplicate cards in my hand. +2 Modded – to help install my now more-expensive programs and hardware. +1 Feedback Filter – as defence in late game final rushes. Now to take a look at my H-B corp deck. 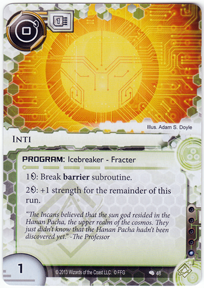 Posted in Blog Posts and tagged Android:Netrunner, lcg on December 22, 2014 by Tim. Now I have a custom runner deck, I need a custom corp deck to play against. Taking the Haas-Bioroid cards from the core set and from the Creation and Control deluxe expansion will give me a range of possibilities. Haas seems to specialise in using its bioroid workforce to do all the work and hence gain extra clicks. These extra clicks in a turn will allow the corp to do what is known as ‘fast advance’, which is to play an agenda then advance and score it all in one turn. 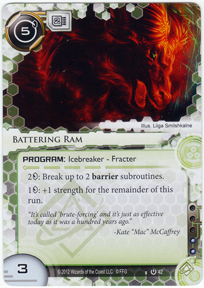 Posted in Blog Posts and tagged Android:Netrunner, lcg on December 21, 2014 by Tim. Moving on from playing with the core set sample decks, I am taking my first step into deckbuilding. Seeing as I have the deluxe expansion Creation and Control, and this is based around the Shaper (green) runner faction and the Haas-Bioroid corp faction, my idea is to create two mono-faction decks. I won’t be using any influence at this stage. I think I ought to be able to tweak the sample decks into something better, something that plays smoother. Starting with the Shaper runner deck, I will stick with Kate as the runner identity. She makes it cheaper to install hardware and programs, which makes it easier to get her rig set up. (The rig is all the installed programs and hardware, including extra memory, icebreakers and other programs). My plan is to select a specific set of icebreaker programs and then build around them to finance and support them. Posted in Blog Posts and tagged Android:Netrunner, lcg on December 19, 2014 by Tim. The figurines are stored in a separate dimension and accessed through a portal within the plastic bag. While watching some videos of Call of Cthulhu tournament games on The You-Tube, I saw people were playing with tiny little Cthulhus as their domain markers, and not the large ones that come with the core set. A little research later and this bag of cyclopean fun was winging its way to me. 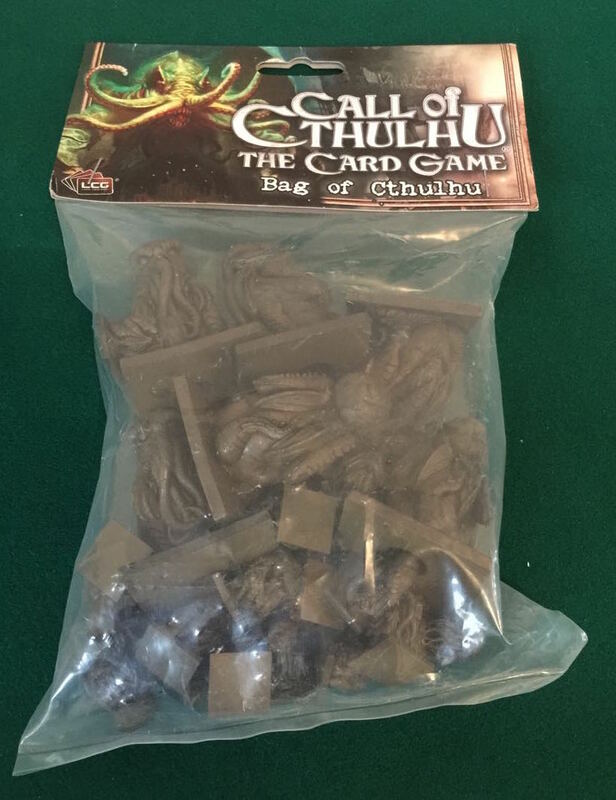 It is a real thing: A bag of Cthulhu. 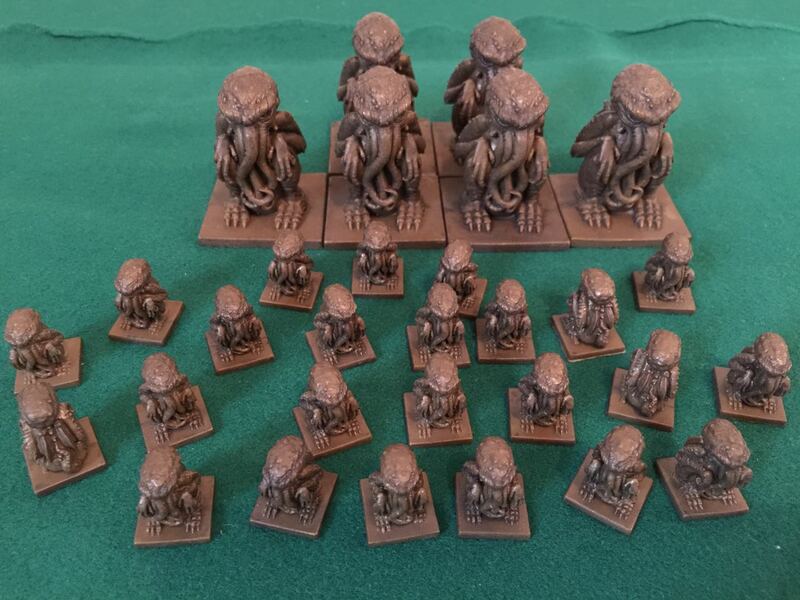 You get six regular large Cthulhus and twenty-four tiny little Cthulhus! The little ones are great for using in games, and they don’t take up as much room in the box, which leaves more space for cards. I now have far too many of the big Cthulhus what with all those that came with the card game core set, but I can probably re-use them in any number of other games. Great Old Ones up the wazoo. Aren’t they cute? Notice how infants 0-3 are most prone to insanity. Sad face. Posted in Blog Posts and tagged Call of Cthulhu LCG, lcg on December 17, 2014 by Tim. As an early Christmas present from our lovely niece and nephew, Lauren and Sam, we now have a copy of the Mage Knight Board Game. This is an epic-style fantasy adventure game, rumoured to even be the best fantasy adventure game. You play one of four heroes exploring the Atlantean Empire, killing monsters, visiting villages, recruiting soldiers, capturing cites, learning spells, etc, etc. All the required fantasy stuff. 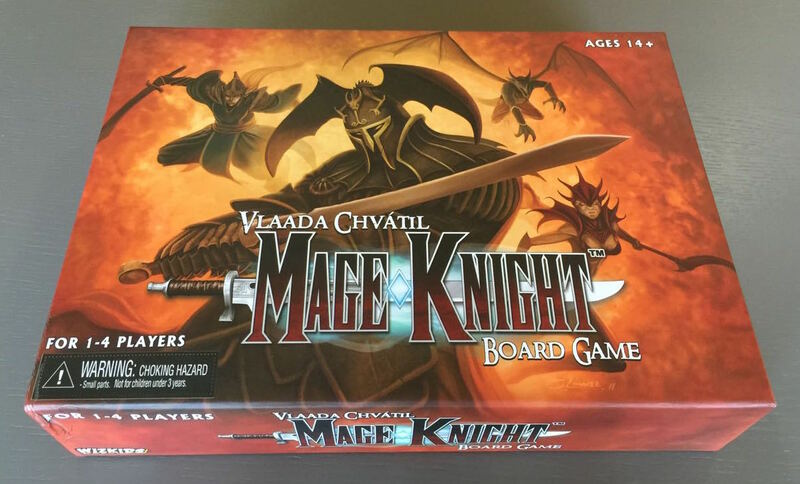 Posted in Blog Posts and tagged Mage Knight, Unboxing on December 16, 2014 by Tim. We ordered a set of special Skull and Shackles dice to go with our Pathfinder Card Game. They are really cool, looking like ivory or bone, and with sea chart-like designs on the faces. 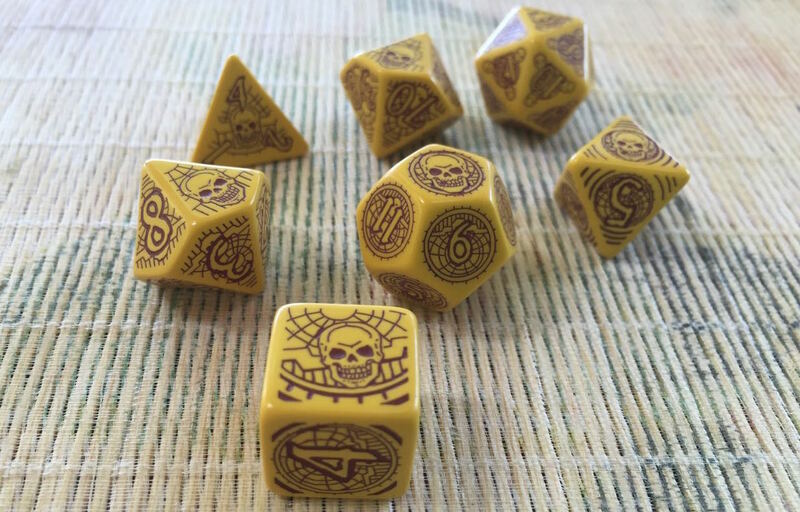 The highest face on each die is a skull. The set is really intended for the rpg, so it includes a d20 and a percentile 10’s. We don’t need these for the card game, but they are nice to have. It is kind of annoying that the game keeps requiring multiple rolls of the same dice as this means we have to include the standard dull blue dice in our rolls. This wouldn’t happen in the rpg, but the mechanics are different in the card game. Posted in Blog Posts and tagged PACG, Pathfinder Adventure Card Game, Skull & Shackles on December 15, 2014 by Tim.